It is hard to expect a high level of knowledge or competence about any serious matter from the majority of people. Under conditions of insufficient data to make their own unique decisions, ordinary people tend to adhere to generally accepted viewpoints (stereotypical judgments) that are established in society. Unfortunately, in doing so, they become carriers and distributors of myth. One of the most discussed myths in the history of mankind is the myth of human landing on the Moon in 1969. On the question of what you have heard about it (or think you know), most often you can hear the banal phrases like: "all people saw it", "the scientists studied," "military tracked", "everyone knows”, etc. If you try to make sense and to understand on what foundation this particular myth has been built, you will understand how all modern myths are created. 3) Actors - who did it. In the first part another internal constituent can be identified - goal-setting, which includes the subject, generating a problem (roughly, "Who needed it"). In this case, it is obvious that the subject (the customer) is a definite group of the human community. What were the objectives pursued by this group? Let's say, quite prosaically, that it was material and moral satisfaction. Material - this is expressed in the enormous budget allocated to the creation of the myth, about 25 billion dollars. Morally - this statement is a paradigm of the humans’ ability of space exploration and the collection of emotional dividends from the human society. Why the technology of myth-making was selected, rather than the actual routine investigations, and hazardous labor-intensive activities - this is the topic of other investigations, preferably taxes departments. In a series of upcoming publications we will continue discussing in detail the new artifacts of this myth - the host of American astronauts on the Moon in 1969-1971. Why do we refer to the term artifact? Because, by definition, artifacts are substances or structures not naturally present in the matter being observed but formed by artificial means. In our case, to destroy the integrity and authenticity of the event in question. Artifact, from Lat. Artefactum – artificially made, is the experimental result that arises because of deviations in the experiment or because of defects in practices. In particular, the results can be disrupted action on the subject of suggestion. We will guide you through the gallery of evidence, process cross-validation of baseline data and "facts", look at them from different angles and put the assessment of the admissibility as evidence. We also ask you to play simple physics experiments so that our statements do not look unfounded. After that, now armed with our findings, we hope the reader will be able to answer the remaining questions himself. This movie on VHS or DVD can be found in almost any public library in the world and has been translated into many languages. The film’s annotation claims that it is a collection of official video, film, and photographic material provided by aerospace agency NASA. Please do not be lazy and watch a movie from the beginning to the end, if you have not already seen it. 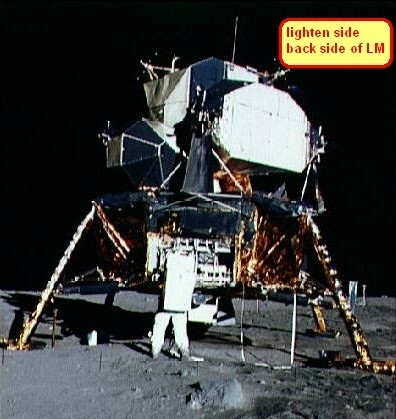 After watching the film, concentrate entirely on the episode with the landing of the Lunar Module (LM). Forward the film to the moment when the episode begins, ostensibly showing highlights of landing of the LM, and begin to examine the scenes carefully. Pay attention to the frame where you see someone's hand tapping a pencil on the table. Immediately after this episode see further action in slow motion so as not to miss anything from these unique frames. Landing trajectory of the descent module is a very gentle descending branch of the parabola. There are only small lateral engines available to pilots in order to make maneuvers. Based its design (see Figure 1), while landing, the apparatus always orients one side (A) to the sun, and another shadow (B) in the direction of motion. The side facing the sun has a thermal protector layer (see Figure 2), and there are no windows and cameras. The front side that has the portholes and a hatch is always in the shadows and always looks forward to the direction of the motion and landing, thereby allowing the astronaut visual and landing control. Accordingly, the cameras always look forward in the direction of travel and scan the approaching surface. 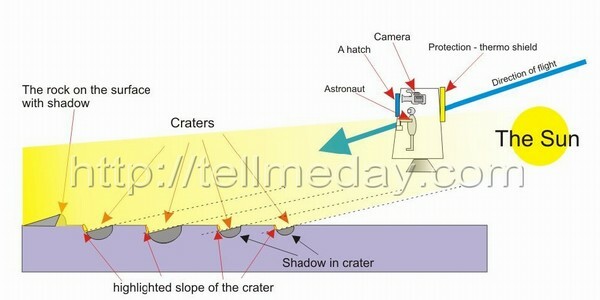 Pay attention to the location of the shadows in the craters visible from the hatch of the LM. As you can see, the apparatus is descending and casts a shadow ahead of itself. The shadows in the craters (geometrically – they are cones) can be clearly seen just behind the rim of the crater which is located closer to the camera. The opposite slopes of the craters are well covered from the sun. This can be verified by looking at Fig.3. Figure 3. Arrangement of shadows and highlights on the crater. On the surface, irregularities are sometimes visible in the form of blocks. They cast shadows in the direction that the apparatus is flying in. 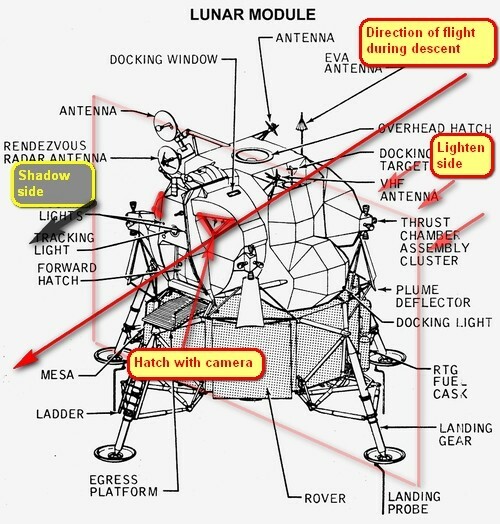 It is difficult to imagine that the lunar module radically changed direction 180 degrees and flew for some time in the opposite direction to the Sun. However, you can see that for 4 - 5 seconds the LM flies in the direction to the Sun without compromising its speed. 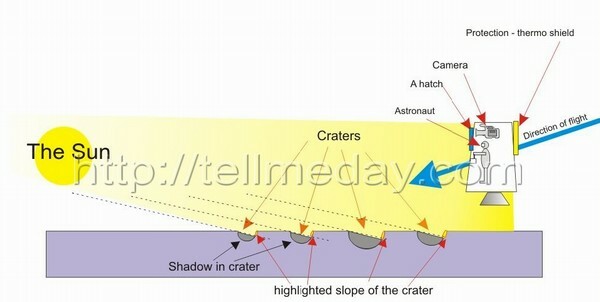 You can notice that the shadows in the craters in this episode are already on the opposite slope, that is, where the sun shines out from (see Figure 4). Figure 4. Flight of the LM in the direction to the sun. It turns out that, since the camera apparatus continues to shoot in the direction of the motion, the LM is now flying towards the Sun! But this is impossible for many reasons: for example, the astronauts principally could not operate the controls in this situation. The LM is specifically designed so that its rear wall is covered with a reflective shield that protects the unit from heating due to the dazzling rays of the sun, and always has to fly with that protective side towards the Sun. Even if it moved back to the Sun, the craters would be farther away from it, but in these episodes, they disappear under the bottom of the LM. Then the frame changes suddenly, and we see again that the unit is safely flying in the right direction, as the shadows in the craters are located in the side closest to the camera. Finally, the LM touches down and casts a shadow of itself, as we see again in Fig. 5. Figure 5. LM landing on the surface. 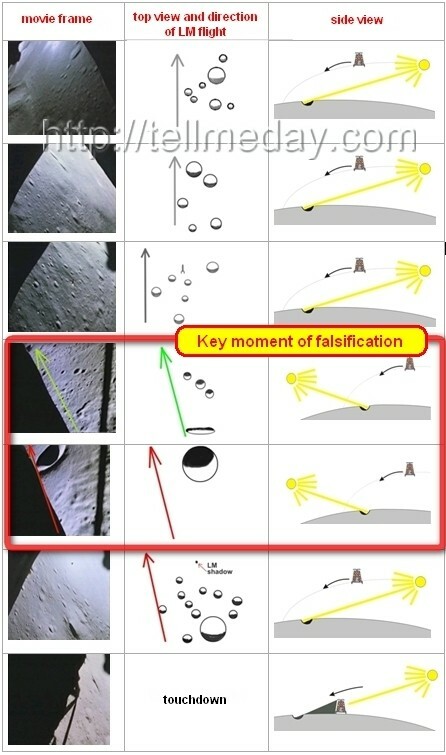 After that, very famous and sentimental footage of the first human activity on the surface of the Moon takes place, but, under given observations and in light of new facts, it is not very believable. As you can see, the behavior of the reentry vehicle, the location of the shadows in those few seconds does not fit reasonable thinking. That's why this episode falls into the category of mythology, and actually makes the declared documentary evidence on the presence of Americans on the Moon into a myth. Draw your own conclusions. If you have something to say about it, please comment in the forums and we can discuss your observations further. There are two possible causes for the mistakes found in this film: the first - the director of this movie just failed to control the direction in which assistants of the operators moved the camera over the layout of the lunar surface and the location of the light sources. The second - these shots were done intentionally and deliberately, were mounted in the tape by the some people involved in the creation of the film as a sign of justification and apology, for future generations to analyze and draw their own conclusions from. We advise you go to a public library, video rental store, anywhere where you can rent the current version of the film and see what we just explained firsthand. Our assumption is that it's not just a mistake of the film director or cameraman, and that it was deliberately left in the filmstrip gaffe. If the person who did it (or his descendants) will respond to this article, their name could go down in history! By this, we conclude that there are no reasons to believe this documentary is true, as follows from the careful analysis and the conclusion that it is, in fact, fake. (see Figure 6). It is very likely that after the publication of this material, old versions of the film will fade from all public libraries and repositories of the world, and will be replaced by a modified cut. Figure 6. A Key moment of the truth. after you read this a couple of times, it does make sense...you could try to make a documentary film on this... I'm pretty sure it would attract more attention.